Wolf developed a Weigh-in-Motion System (WIMS) for the U.S. Army to detect anomalously loaded vehicles (such as those carrying vehicle-borne improvised explosive devices (VBIEDs)). The smart device is designed to be installed at bases and checkpoints both domestic and abroad. The WIMS device continues Wolf’s legacy of developing safety systems to better protect our women and men in the armed services. It has been tested at Wolf’s research facility north of Indianapolis and at our customer’s site. The smart technology developed for WIMS accurately determines total vehicle weight as well as individual axle and wheel weights of passing vehicles. But since many checkpoints have serpentine approach layouts that are designed for speed control, the WIMS must also measure the lateral weight shifts associated with turning vehicles, and compensate for those weight shifts analytically using vehicle dynamics calculations. 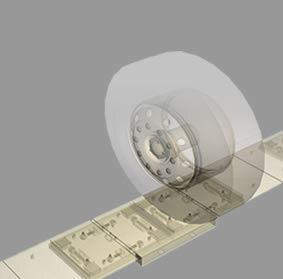 Once the wheel weights are corrected for any maneuver-induced weight shifting, the results are analyzed to determine whether the vehicle is normally or anomalously loaded. The system also measures the wheelbase and track width of the passing vehicle for use in the analysis. 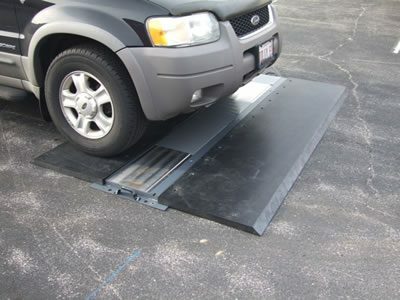 The WIMS system can be installed permanently embedded (flush) in paved, gravel or compacted dirt roadways, or temporarily on top of the roadway. It can be easily installed, or moved to another installation, by two people. Wolf is currently investigating commercial applications for the device as well.